Our DK 2000 Mobile Detailing Pressure Washer will hold up to day-to-day use and last much longer between servicing than a consumer grade unit. This gasoline unit is built strong with a Briggs and Stratton Engine, giving you the power to cut though grease, dirt, and grime. 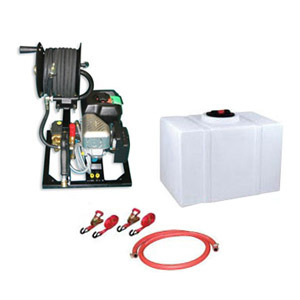 You can mount this car detailing pressure washer unit to the floor of your pick-up truck bed, or van. Our DK 2000 is designed with a direct drive pump, allowing it to draw water from a water tank (static source). 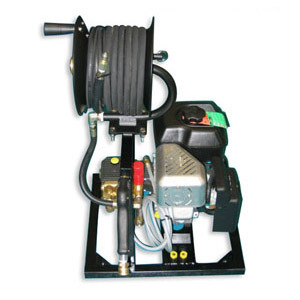 Other units that you would purchase at a local hardware store or an online discount house will not contain the direct drive pump, and will not work in conjunction with your pressure washer. 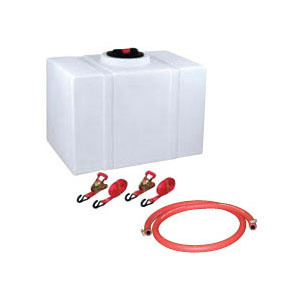 You can also connect this unit to a hose from a water faucet, and simple switch your pump off. To learn more about our DK 2000 pressure washer be sure and our pressure washer for mobile detailing video. Note: This unit comes and is priced with a 100 gallon water tank as the standard. Other size tanks are available with our DK2000: choose from 60, 100, 115, 150, 200, & 330. We also can special size tanks made for situations where you are limited on space. Please call for pricing.